Short time after the Cleveland Cavaliers won their first NBA championship, free agency officially begins on Friday. Kevin Durant is actually the most mentioned free agent. The basketball superstar dominates the sports news in the US. 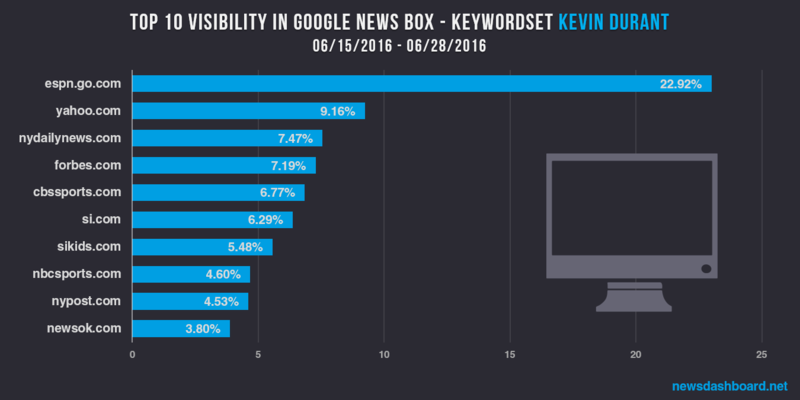 We analyzed which US publisher had the highest visibility in the Google News Box for the keyword “Kevin Durant”. Therefore, we looked at both the classic desktop News Boxes between 06/15/2016 – 06/28/2016 and at the data for the mobile news results between 06/18/2016 – 06/24/2016. It´s not very surprising that espn.go.com is clearly the winner of the classic desktop Google News Box between 06/15/2016 – 06/28/2016. The sports site had a visibility of 22.92 percent. On second position, yahoo.com is clearly behind with a still strong visibility of 9.16 percent. The other news publishers of the Top Ten are close together. On fifth position is cbssports.com with 6.77 percent visibility, followed by si.com (Sports Illustrated) with 6.29 percent visibility. Also nbcsports.com and nypost.com are in the Top Ten. We see quite a different picture regarding the Top Ten of the mobile results between 06/18/2016 – 06/24/2016. Surprisingly, espn.go.com is not in the Top Ten. The sport site is only on the thirteenth position. Leading the visibility at the classic desktop News Box, espn.go.com is much weaker concerning the mobile News Box. Looking at the mobile results for the Google News Box for the keyword “Kevin Durant”, nbcsports.com is on first position. Yahoo.com is on second position, like in the desktop News Box. Foxsports.com, nesn.com, sneakernews.com, bleacherreport.com, welcometoloudcity.com and 247sports.com have a much higher visibility in the mobile Google News Box than in the desktop version. Espn.go.com dominates the classic desktop Google News Box, but has a much lower visibility in mobile News Box. Yahoo.com is quite good at both. To sum it up, the visibility of US publishers concerning the News Box for the keyword “Kevin Durant” varies widely between desktop and mobile.